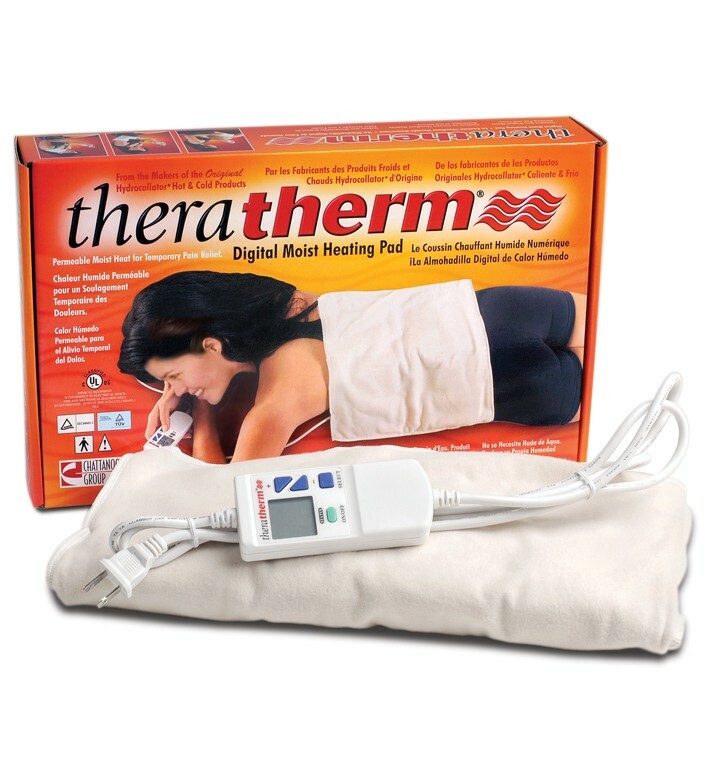 Is the Theratherm Automatic Moist Heat Pack right for me? Designed for temporary relieve of back, shoulder, wrist, stomach, knee or foot aches and pains. Try our Brace Advisor for personalized product recommendations to meet your needs! Designed for the convenience of home use. The digital moist heating pad is designed to provide temporary relief from pain associated with muscle spasm and inflammation caused by strain and tension. Digital hand control allows operator to program, as well as monitor, the temperature and treatment time. Allows patient to relax and enjoy therapy without the hassle of maintaining contact with a hand held switch. Therapeutic treatment temperature between 88° and 166° F.
Treatment time between 1 to 60 minutes. For all warranty issues on product ordered at BetterBraces.com, please email service@betterbraces.com with your order information and description of warranty issue. If your item is within the warranty period a replacement will be sent to you. Pictures and/or return of the product for inspection can and will be requested for all Warranty claims before a replacement item will be issued. Can this be used in the Philippines - is it dual voltage ? The Theratherm is only 110v. You will need a power converter to use in the Philippines,. I have several types of arthritis. My right hip joint where my leg attaches to my body (not where you show hip support...lower) is often painful. You do not list a product that I can see for it. What would you recommend! Which product would be best for neck ONLY? I don't really want to use a large pad for the entire shoulder and neck area. what/how is the heat pack "moist"? The item contains a proprietary component in which moisture is drawn from the air and as the pack's temperature rises, the moisture is released onto the skin. If you have further questions, you can contact Chattanooga product support at 800-494-3395. I have been doing a lot of lifting and moving items and my back especially my lower back. Has been giving me a lot of discomfort. After using this product for several times for 30 minutes each. I have been able to get up from my chair and walk immediately without having back pains.I really love this Moist Heat Pack! I am only functional with the help of my Theratherm. The warm heat drives away soreness and stiffness. I use it daily. Pros: Moist heat, customizable temperature, customizable, time, convenient size. I suffer from Anklyosong Spondylitis. It really helps with some of my worst flares. Love it!!! This is the 4th heating pad I have bought. My family and myself love them. Pros: High heat large size. Best heating pad I've ever used! I love the moist pad.